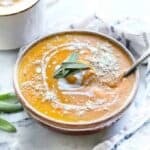 Easy Slow Cooker Butternut Squash Soup comes together quickly for a delicious side dish or main course. 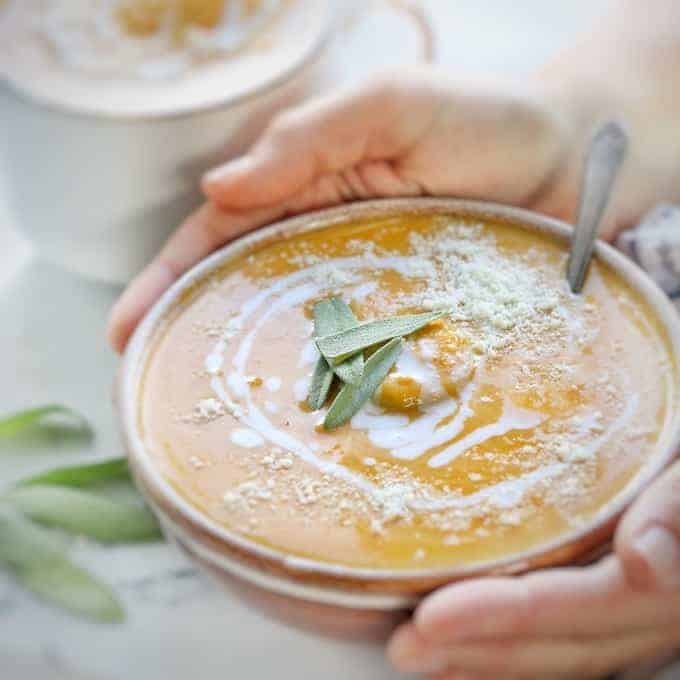 It combines squash, apples, carrots, and coconut milk into a creamy, kid-friendly butternut squash soup recipe. I used to be intimidated by the butternut squash – but no more! Once I learned how simple it was to peel and dice, I was much more comfortable with this delicious fall food. Keep reading – I’ll show you exactly how to peel and dice butternut squash yourself! 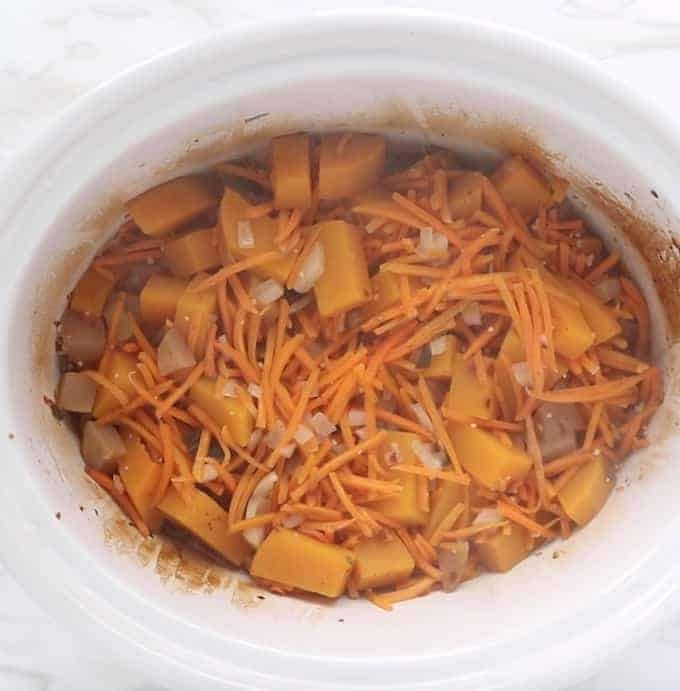 Some of my favorite ways to utilize this fall beauty are in caramelized butternut squash, cooked in the crockpot, or in a delicious pasta dish. 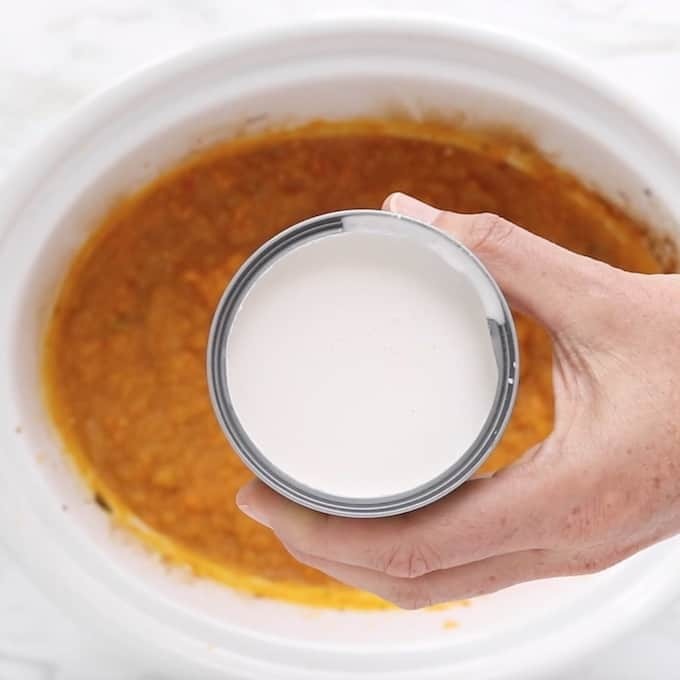 Check out the instructions below, or watch my how-to video to learn just how to make this easy slow cooker butternut squash soup! Using an apple peeler, peel the butternut squash, remove seeds, then dice. 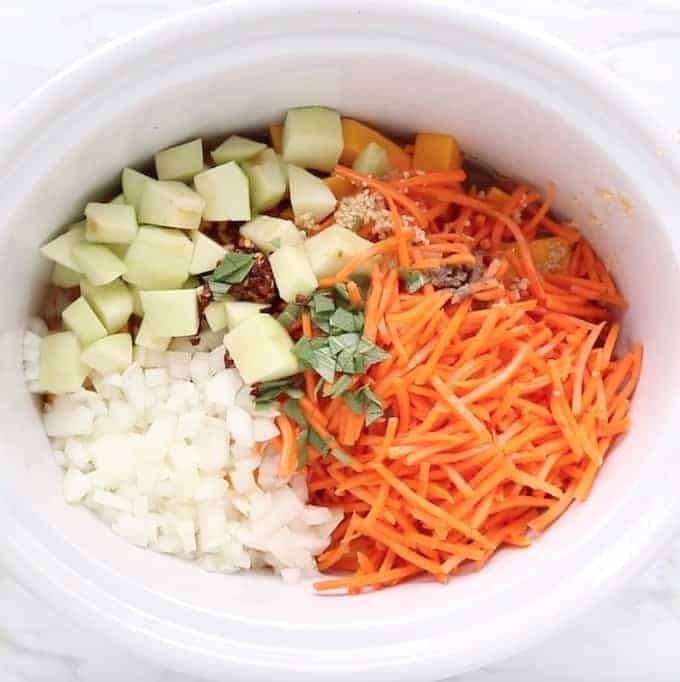 Place squash, carrots, onion, and apple into the crockpot. Add chicken stock, garlic, sage, red pepper flakes, salt, and pepper. Stir. Puree with immersion blender or carefully pour into blender. Stir in coconut milk, enjoy! 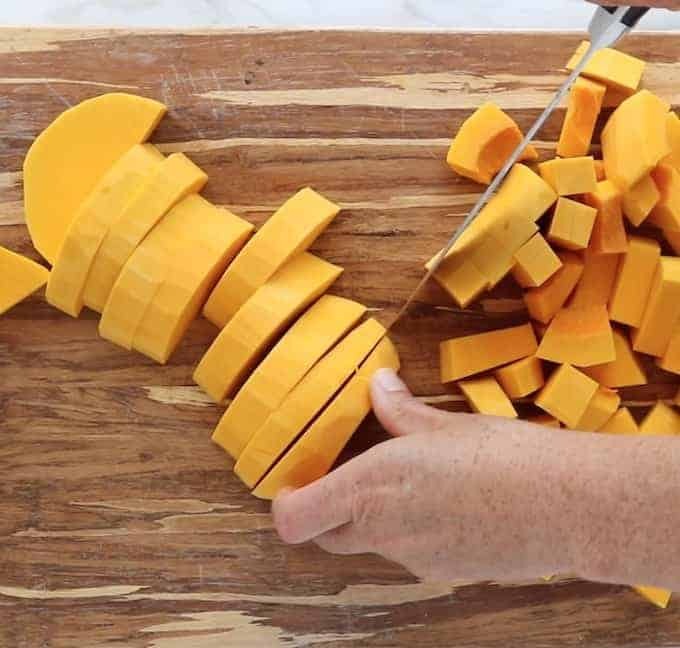 Start by slicing the ends off of the butternut squash, peel with an apple peeler, scoop out the seeds, then slice into squares. Watch the video to see exactly how to do it. Pro Tip: You can purchase diced squash at your local Costco or another local grocery store if you’d like to skip the peeling & dicing steps. Add all of the ingredients – except for the coconut milk. To save time, I buy a bag of shredded carrots. I usually add them all into the soup just to save on the leftovers, but the butternut squash flavor is stronger with fewer carrots. 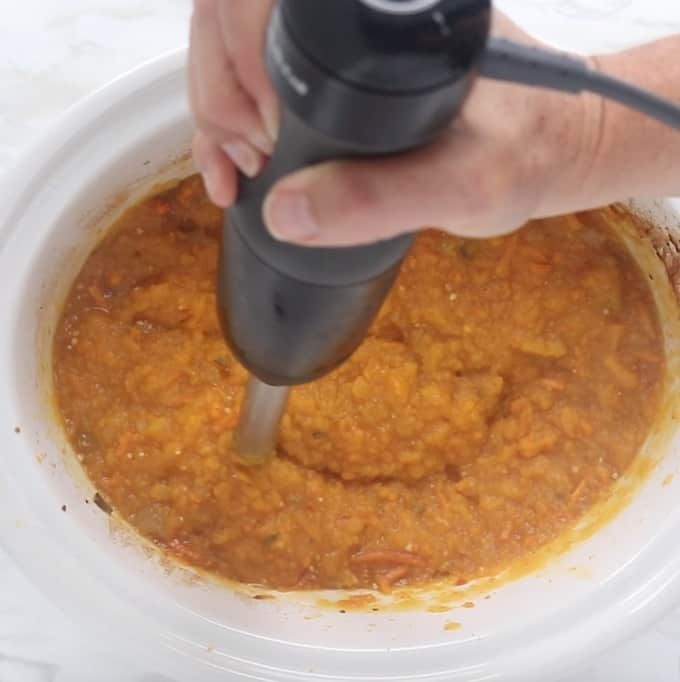 Using an immersion blender, or your regular blender, carefully puree the butternut squash soup. Pro Tip: Immersion blenders are a fun kitchen tool that comes in handy when trying to get kids to eat more veggies. You can use it to puree spaghetti sauce, chili, soups etc, blending vegetables into sauces seamlessly. Check out my favorite immersion blender here. Lastly, stir in the can of coconut milk. 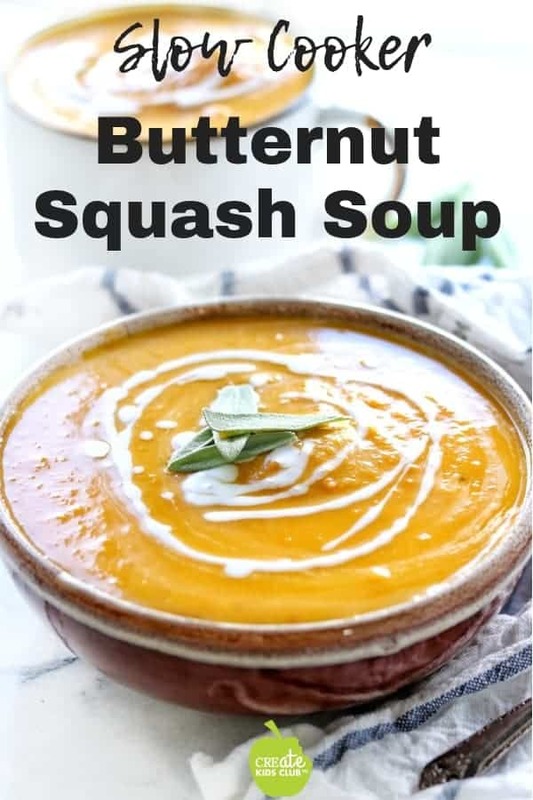 This adds an amazing creaminess to the soup and the slight coconut flavor goes really well with the sweetness of butternut squash. Pro Tip: Not a fan of coconut? Try evaporated milk or 2% milk. Serve topped with drizzled coconut milk, parmesan cheese, or fresh herbs. 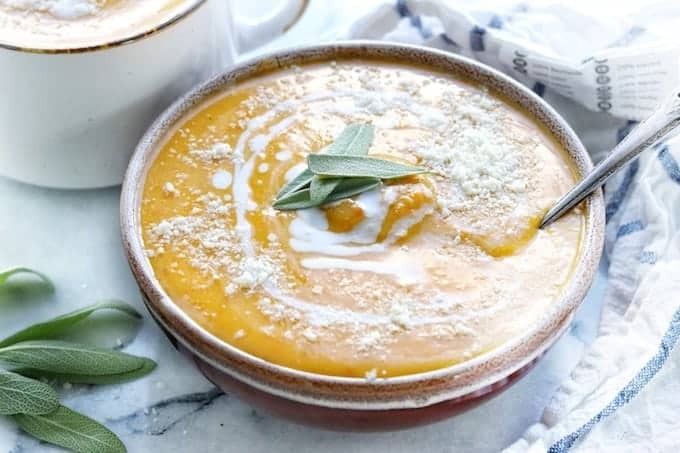 A delicious slow cooker butternut squash soup recipe that combines squash, apples, carrots, and coconut milk into a creamy soup the whole family will love. Cook on high for 1-2 hours or low for 3-4 hours. Love pumpkin? Stir in a can of pumpkin puree, a delicious addition. This recipe is adapted from Slow Cooker Butternut Squash Soup by Gimme Some Oven. Interested in more squash recipes? What does the coconut milk do? Hi Julia! The coconut milk gives the soup a delicious creamy and just slightly coconut flavor. It is one of my favorite ingredients. If you are not a fan of coconut or there are allergies, you could substitute it in equal amounts with 2% milk or evaporated milk. I would love to hear if you try it! 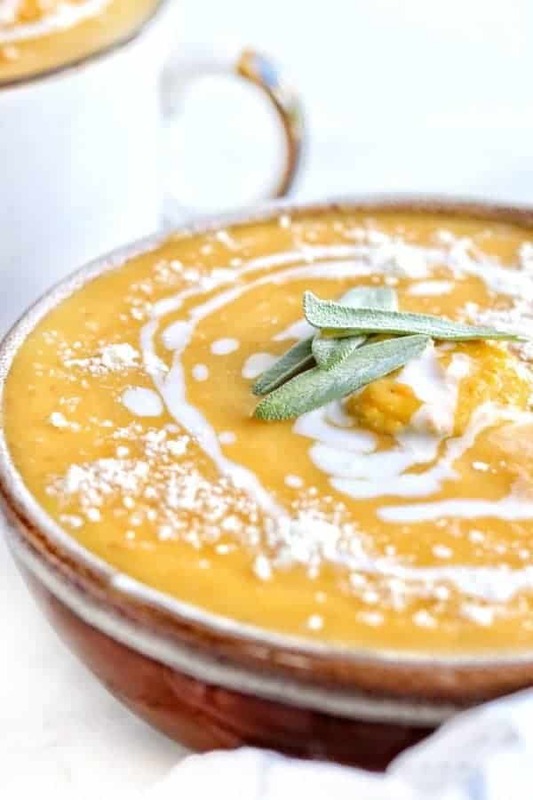 Who knew butternut squash soup was so good? !